It starts with an appealing sizzle. 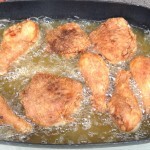 That crackly sound when you place the floured raw chicken parts into the hot oil. And there is that occasional big POP when a drop of water eeks out into the oil. Combine that sound with the heady smell of yummy juicy crispy fried chicken and doesn’t it feel primal? I get this desire deep inside that reminds me that meat is delicious, and nothing is quite like good southern fried chicken. Buttermilk biscuits with butter and honey are a preferred complement, but alas, optional. When I was a young girl, maybe 6 or 7, my parents would make and serve fried chicken and buttermilk biscuits for dinner every Sunday night. I’m sure we had some sort of vegetable too, but it must have been unremarkable, or perhaps something I blocked out, like Brussels sprouts cooked beyond recognition or Lima beans from a can. What a happy memory for me though of that fried chicken and biscuits … And it’s a memory that includes smell, taste, sound, and touch of that heavenly meal. 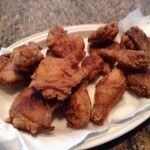 I have drastically modified my mother’s recipe, and here is my personal favorite Fried Chicken. 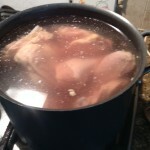 Brine the chicken pieces in 4 quarts water with ¾ cup of kosher salt for an hour. Make sure the brine stays cold… either keep in in the refrigerator or keep ice in it. Keep it covered. 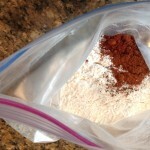 Put 3 cups of flour in a bag you can use to shake the pieces – I usually use a gallon zip-top bag and throw it away when I am done. Add sweet paprika, smoked paprika, salt and pepper and shake. 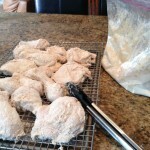 Then use tongs to remove the chicken from the brine and shake in flour mixture, about 3-4 pieces at a time, and then place on a wire rack that is placed over a cookie sheet to catch the flour that falls off. When all the chicken pieces have been floured, let sit for 15 minutes and then re-flour all of them by shaking them in the bag again. I think this makes the chicken extra crispy. Throw the seasoned flour and shaking bag away. Put ½ inch canola oil in an electric skillet and let heat to 375 degrees. Add 2-3 Tablespoons of bacon fat for flavor. 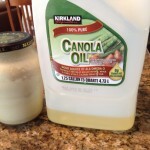 I save bacon fat in an old clean mustard jar… you must store it in the refrigerator. 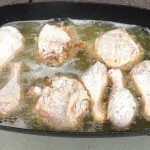 Fry chicken pieces, partially covered, 13-15 minutes per side or until golden. DO NOT CROWD the pan. 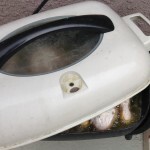 I cook it outside so the smell of used cooking oil doesn’t stick around past dinner. Remove to a large platter lined with paper towels. Enjoy! Make sure your brine stays cold (add ice or keep in fridge) and covered. You can use a zipper bag to coat chicken pieces. Don’t re-use it, throw it away when you are done. Let floured pieces sit on a rack over a sheet pan for 15 minutes, and then re-dredge in the flour. A combo of oil and bacon fat yields a delicious end result. Don’t crowd the pan. Cook outside so smells don’t stick around past dinner. Partially cover during cooking time. Uh… I chose the wrong time to read this. 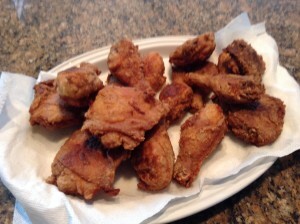 It’s 10:42pm on a Sunday night, and now I want fried chicken! 🙁 This recipe sounds fantastic! WOW…I am really hungry and my salad look wretched after viewing this yummy dish and how to make it. I will try this and I will place “2” fire exstinguishers next to me, yes, I am that talented in the kitchen. HAHAHA!